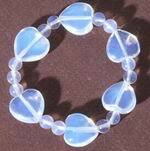 Sorry, we are currently sold out of 'Unusual Mother of Pearl Heart Bead Strand'. Please check back later. Sorry, we are currently sold out of 'Unusual Tigers Eye Puff Heart Beads - for protection'. Please check back later. Sorry, we are currently sold out of 'Very Sleek Arora Boliaris Hematite Heart Beads'. Please check back later.